There’s no slowing down for me as a hog roast caterer in Whalley! This large village sits in the picturesque Ribble Valley, in the shadow of the renowned Pendle Hill of Witch Trials fame. This year marks the 400th anniversary of the trials, and there are many events being organised to commemorate the occasion. The date ‘1612’ is even being painted on the side of Pendle Hill! Though the summer may be drawing to a close, we still have plenty of bookings through the Autumn and Winter months. 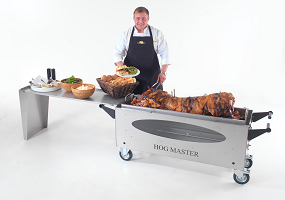 The hog roast Whalley van has been buzzing around Whalley’s nooks and crannies to bring our machines and hog roast expertise to private parties and corporate functions all summer long. Our village hosts a large hotel and golf complex, as well as a beautiful cistercian Abbey; these make Whalley a much sought-after setting for weddings and corporate functions. With delicious locally-sourced fresh meat, our hog roast Whalley catering team is always ready for the call, whether it’s helping a party keep swinging or providing a memorable culinary experience for business associates. People from all walks of life find it difficult to resist a hot pork roll drizzled with tangy apple sauce, or smothered in our stuffing, and a piece of crunchy crackling on the side. Every December Whalley hosts its annual Pickwick night, where the whole village is transformed into a Dickensian street scene. There are quaint market stalls, vintage entertainment and plenty of eating, drinking and being merry. The hog roast Whalley has become a central part of the festivities. It’s usually pretty nippy up here in December, so hot, succulent meat is a popular way to keep the warmth in and hunger at bay! People round here really seem to appreciate the spectacle and gather round the machine as soon as that aroma starts circulating; they also have a real passion for wholesome, perfectly-cooked food. And it’s not just hog roasts we provide: our machines have the facility to deliver roasts to meet your needs, from succulent chicken to delicious, tender lamb. We’ve also had a bumper year for our speciality salad buffets, vegetables and barbecue menu. We have a variety of hog roast Whalley menu options available to suit any gathering. We also have a dedicated team of catering staff who will provide a friendly, efficient service and keep waiting to a minimum. Making a day special, and taking pride in cooking food that puts a smile on people’s faces is what gets us up in the morning! Whatever the weather, whatever the occasion, if you want to give your party the ‘Wow!’ factor, drop us a line at hog roast Whalley. Just let us know what you need and we’ll do the rest.